The Phi Beta Sigma Fraternity Incorporated present UCF’s Type 1 diabetes Group with a $250 donation. 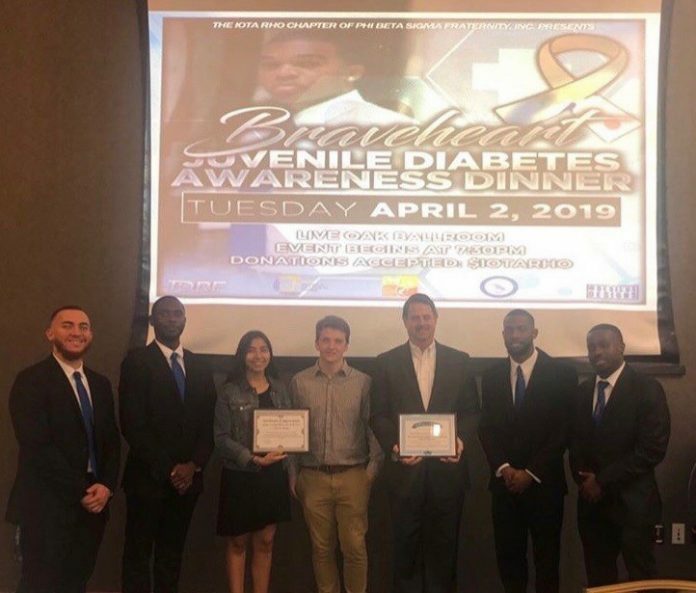 The fraternity held their fifth Braveheart Juvenile Diabetes Awareness Dinner in the Live Oak Ballroom Tuesday evening. Photo by Bethanie Derice. What started as a dinner to honor a fallen brother turned into a larger discussion about diabetes in juveniles. The Iota Rho chapter of the Phi Beta Sigma Fraternity Incorporated at UCF hosted its fifth Juvenile Diabetes Awareness Dinner in the Live Oak Ballroom Tuesday evening. Dinner was also served assembly-line style as an intermission for the event. The dinner was started in 2012 to honor the fraternity’s fallen brother, Anwar “Braveheart” Rashid, who passed away from Type 1 diabetes in 2011. Type 1 diabetes is a disease that can unexpectedly affect adults and children, according to the JDRF website. The immune system of people with the disease will attack healthy cells thinking that their foreign. Although the event was supposed to be an annual one, it was halted in 2016 because of funding cuts by the agencies the fraternity partnered with and the high price costs for event venues, according to Nick Wise, the chapter’s president and organizer of the event. Wise says that as the years went by, students that came to UCF after Rashid’s death didn’t know who he was and that the event needed to be transformed into something more than just honoring their brother. “We wanted to make it more of an awareness event where we could warn people about the signs and symptoms of Type 1 diabetes,” Wise said. Unfortunately, there is no cure for Type 1 diabetes however, Bernstine says his foundation is working hard to analyze the research that they do and work towards that cure.